The Barataria-Terrebonne National Estuary Program (BTNEP) works to protect and preserve the culture and land located between the Mississippi and Atchafalaya Rivers in Southeast Louisiana. BTNEP is one of 28 National Estuary Programs throughout the United States and its territories. Congress established the National Estuary Program (NEP) through section 320 of the Clean Water Act in 1987. The Barataria-Terrebonne estuarine complex became a National Estuary in 1990. BTNEP was established in recognition of the national significance of this estuary system. Where Is the Barataria-Terrebonne National Estuary? The Barataria-Terrebonne National Estuary is located between the Mississippi and Atchafalaya Rivers in south Louisiana. Bayou Lafourche separates this complex into two basins, Barataria Basin to the east and Terrebonne Basin to the west. The Barataria-Terrebonne National Estuary includes all or parts of 16 Louisiana parishes. Those parishes include Ascension, Assumption, Iberia, Iberville, Jefferson, Lafourche, Orleans, Plaquemines, Pointe Coupee, St. Charles, St. James, St. John the Baptist, St Martin, St. Mary, Terrebonne and West Baton Rouge. The mission of BTNEP is the preservation and restoration of the Barataria – Terrebonne estuarine system, the 4.2 million-acre region. BTNEP strives to rebuild and protect the estuary for future generations through the implementation of a science-based, consensus-driven plan that utilizes partnerships focused on the estuary’s rich cultural, economic, and natural resources. The Management Conference delineated the fundamental goals of BTNEP in 1992. These goals provide the basis for all action plans found in the Comprehensive Conservation Management Plan (CCMP). 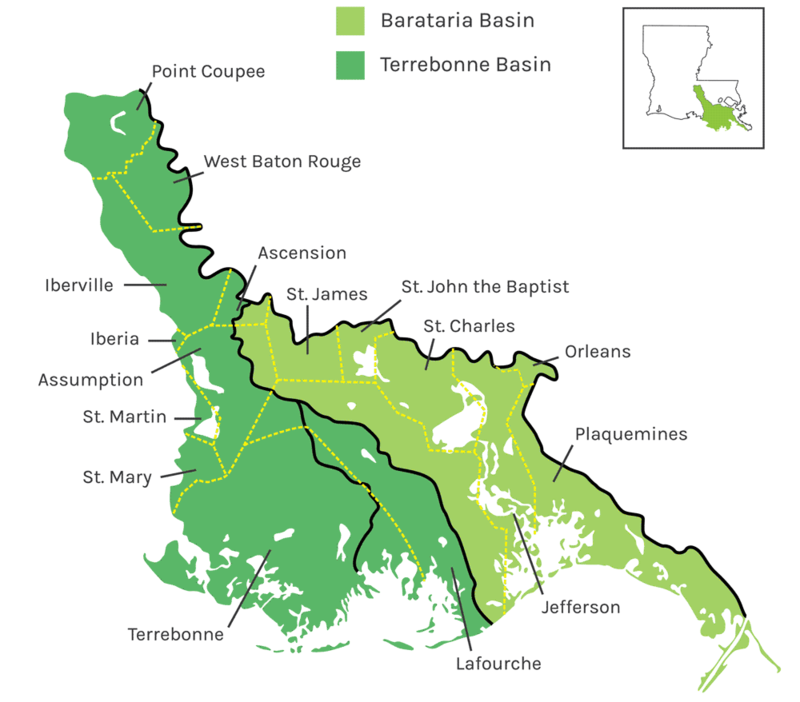 The people of Louisiana and the Barataria-Terrebonne estuarine basins believe that the Barataria-Terrebonne ecosystem is a national treasure, which represents a unique multi-cultural heritage. It is further recognized that our communities’ ongoing stewardship is critical to its preservation, restoration, and enhancement. This stewardship can only be maintained by active support of those who live in the basin, and those who use its abundant resources locally, statewide, and throughout the nation.